Improved organization impressed runners at yesterday's Shanghai International Half Marathon, though some of them were affected by the hot weather. 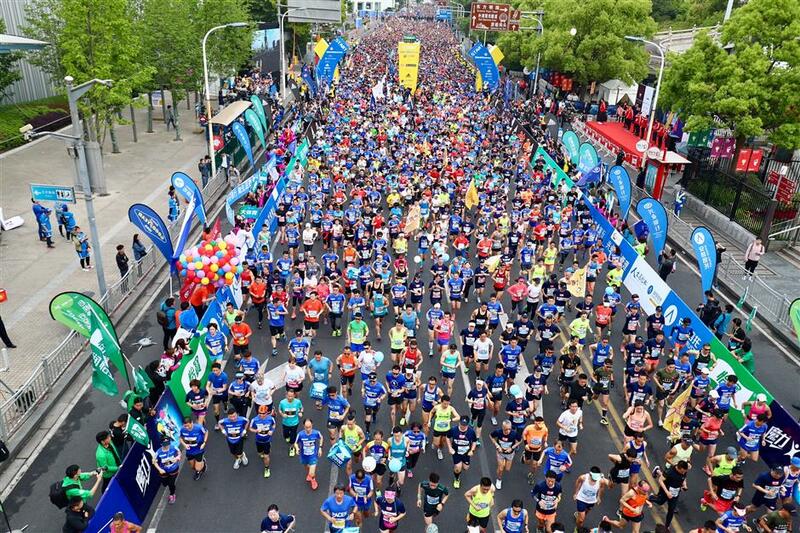 15,000 runners took part in the 2018 Shanghai International Half Marathon. 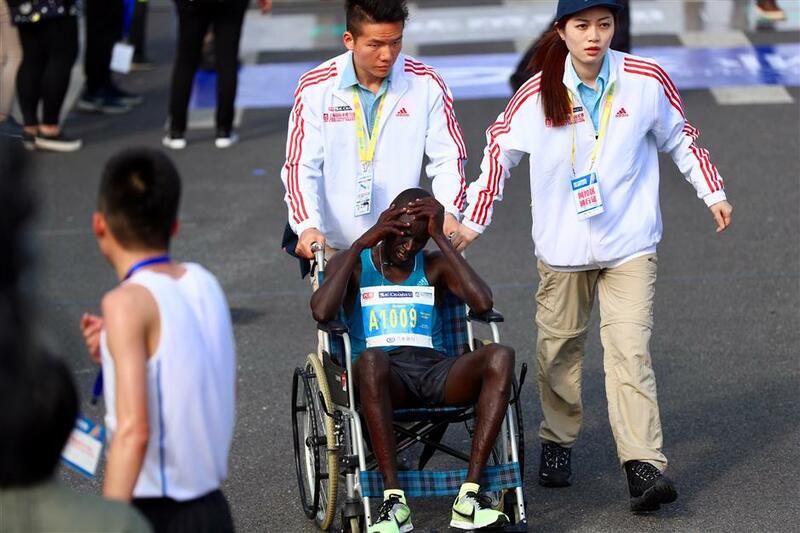 Improved organization impressed runners at yesterday’s Shanghai International Half Marathon, though some of them were affected by the hot weather. 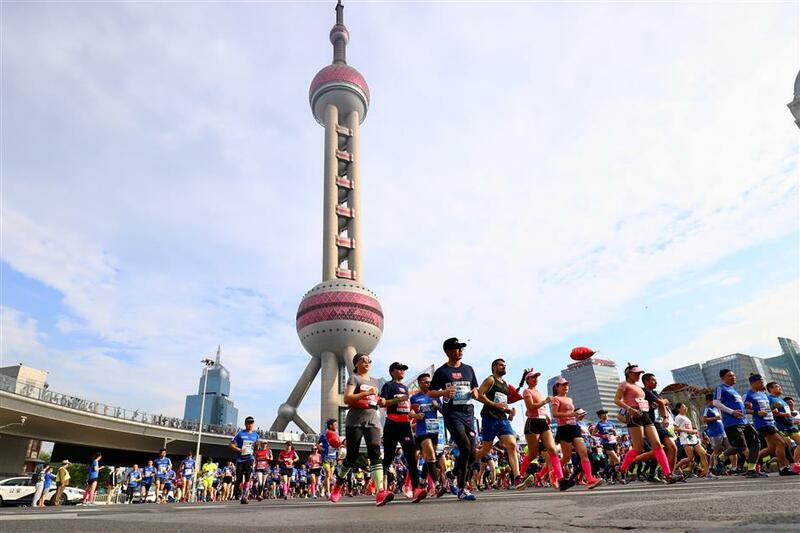 A total of 15,000 hit the road running in the sunshine from Shanghai Oriental Pearl TV Tower. Yesterday the city recorded the year’s hottest day so far when the mercury climbed to 28.8 degrees Celsius, and on some parts of the route, near 30-degree temperatures were recorded. Heatstroke incidents were reported especially in the latter part of the competition. According to the organizers, about 20 runners received medical care, though there were no severe cases and 98 percent of runners completed the race. This year’s event saw the first time a “blue line” was printed along the route of a marathon event in China, indicating the shortest distance of a certain part of the route, especially at turning places, helping runners aiming for a faster result. By following the lines, they will have covered exactly 21.0975 kilometers when they reach the finish line at Pudong’s Oriental Sports Center. 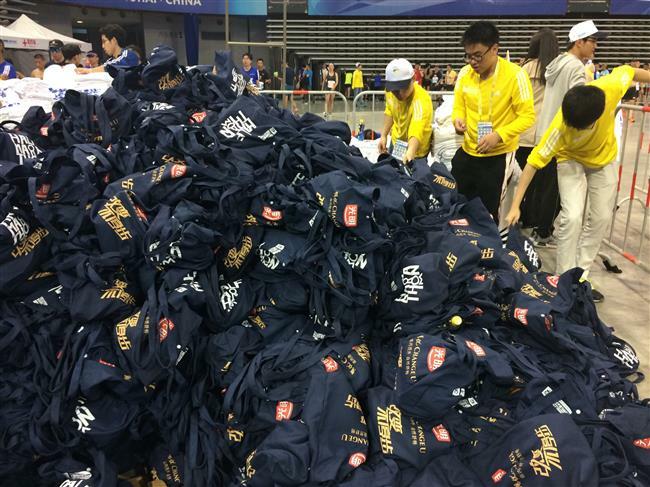 “It’s the first time we introduced the blue line, which required more efficient work from us on the day ahead of the competition,” said Zhou Jin, general manager of the race organizer Shanghai Donghao Lansheng Event Management Company. “Due to Shanghai’s road management, we were given only one night to prepare the route. We printed nearly 20 blue lines, mostly in turning places, to give elite runners a reference,” said Zhou. Blue lines are a common practice in some renowned marathons including the New York and Berlin events. The 33-year-old IT employee finished the race in two and a half hours, 10 minutes over her expectation. “The weather affected me a bit, and I did not want to push myself too hard,” said Zhang, who said she witnessed a few heatstroke incidents in the latter part of the race. There were extra medical staff and ambulances assigned to the last 6 kilometers of the route. According to the organizer, water stations were set up from the 5km spot onwards. There were five water spraying spots along the route to help runners beat the heat. Wet sponges and ice were also available. There were 21 medical spots along the route, as well as 88 sets of AED equipments. Over 800 security staff, 140 referees and nearly 1,600 volunteers were on duty for the event. As with last year, runners hit the road in two batches. This year, the time gap was increased from five minutes to 15 minutes. The first batch left the start line at 7am. 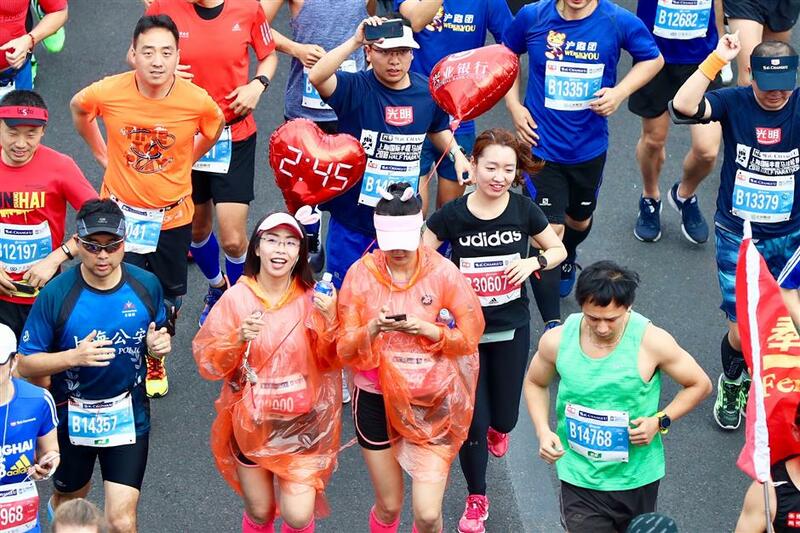 “The adjustment was made to further improve runners’ running experience, giving them a more comfortable and spacious environment,” said Zhou. The men’s race was won by Kenya’s Geoffrey Kimutai Koech, clocking 1 hour 3 minutes and 16 seconds. He was followed by compatriot Albert Kipkosgei Kangogo (1:03:20) and Abera Ketema Tilahun (1:05:03) from Ethiopia. 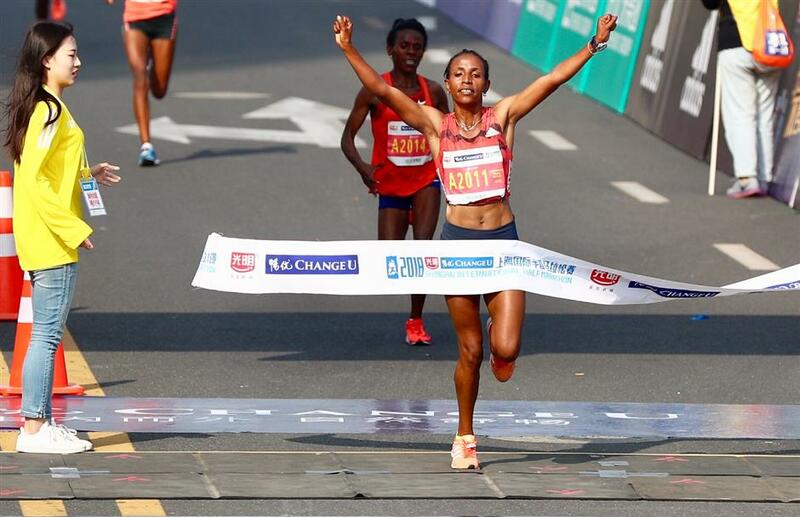 Ethiopia’s Haftamnesh Tesfay Haylu took the women’s crown clocking 1 hour 12 minutes and 32 seconds, followed by compatriots Wude Ayalew Yimer (1:12:33) and Yeshi Kalayu Chekole (1:12:37). 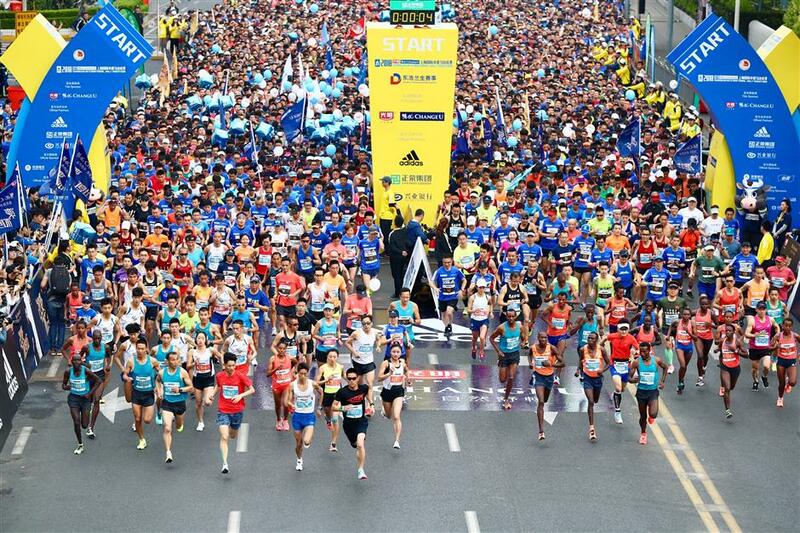 The top 600 male and 300 female runners will win a direct entry into the 2018 Shanghai International Marathon in November. Near 1,600 volunteers provided service for the event. At the finish line, some runners received a special welcome from their children who awarded the medal to their parents with their own hands. It was a new measure introduced this year to encourage family participation in the running event. The children were participants of the 2018 adidas Kids Mini Marathon which was held one day ahead of the Shanghai International Half Marathon. If a parent was running in the half marathon, while his or her child has taken part in the 4.2km mini marathon, they could apply for the special welcome and award medals for family member at the finish line in both competitions.